Time sure is flying over this way. I am officially on hiatus from completing new Sisterlock™ Installations. I am still servicing my current client base but any new clients who have called have been told that I can’t complete any new installations until May. I really thought I was going to lose a lot of business during this time of preparation and to my pleasant surprise I really haven’t. I referred a couple of clients to a business partner in Conyers but the others are willing to wait. Now I have a nice waiting list of clients that want Sisterlock™ Installs upon my return in May. I am really grateful to have a great client base that pass out my cards and give their friends my information who may be interested in Sisterlocks™. I was told that you have to weed out the bad eggs in the beginning and as you have read through my blog I have had my share of bad eggs. But now my clients are some of the most loyal and sweet people I have met. I thank God for that. When I say time flies, I mean time flies. I am now 51 days from meeting my son. I am 9 days away from flying home for my baby shower. I will have plenty of pics and video to share once I return. 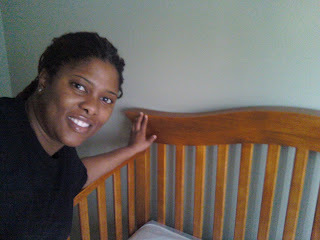 The room is ready with the crib, changing station and dresser set up. 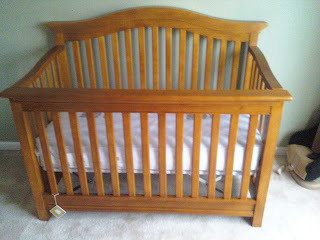 I just need to decorate and get my glider in there before he gets here. I have been doing a little shopping here and there, but nothing too big because I was warned to wait to see what the baby shower would bring. That is like telling a kid not to eat the candy that is sitting in front of them. There are so many sales going on and the coupons have been burning my pockets up. 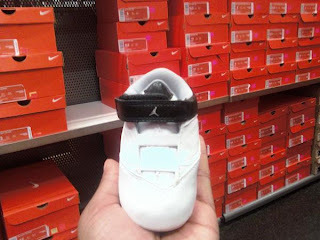 I did visit the Nike Outlet and was able to find a pair of baby Jordan’s for $19. I not only got my son a pair but my cousin’s son as well. Aren’t they the cutest little things? Oh let me add that my amazing DH is being sneaky again like he did leading up to my birthday last year. He is only this sneaky and secretive when he is planning or doing something without my knowledge. Last year he surprised me with my Louis V bag. This must be really big because I can’t find anything in the house. Yes! I am that person who will tear the house up to find out what the surprise is. I am just like my dad with that. Fortunately for my DH is that I am so TIRED right now that I haven’t really been giving this surprise thing much of my time. I know there is something going on but choosing between sleep or finding the gift….umm I will take this good ole sleep right now.